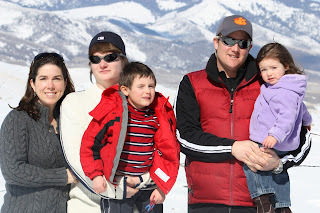 Through the wonders of modern technology, I have this group photo of my family taken last week in Montana. Chase came to spend his spring break with Travis and Becky, Marley and Parker. I think they spent most of the week either skiing, snowboarding, or soaking in the hot springs at Chico. I made a Skypeout call to them, and it was fun to hear Chase sounding exactly like his dad! Hopefully, this summer they will have the right computer hook-up to do a real Skype call and I'll be able to see those precious faces...big and little! What a very nice family. Lovely background also. The kids are all looking so big!